Recovering from a cold is not as easy for a cat as it is for a human. If your kitty has the sniffles, get her to the vet right away. Upper respiratory infection is like the common cold, but much more deadly in cats. If caught early, it can be treated with promising results, but there are other reasons a cat could become congested. 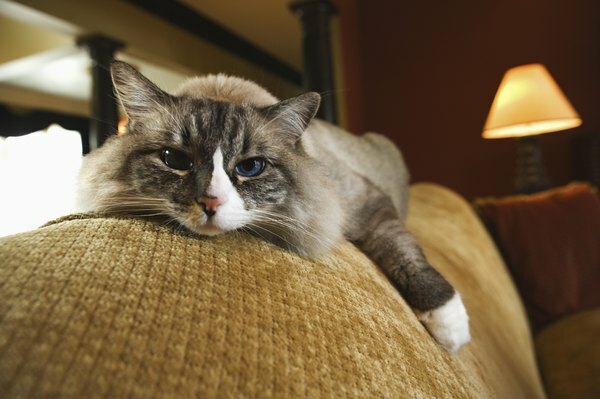 Allergies can cause congestion in cats, according to Dr. Donna Spector, a veterinarian who specializes in respiratory problems in pets and serves as the in-house vet for Halo pet products. If the congestion produces a clear nasal discharge, your cat could have a food or flea allergy, or may be allergic to something in the environment, such as certain grasses, weeds or pollen. Your vet will use a series of diagnostic tests to determine if there is an allergy as well as the allergen itself. If allergy tests are positive and conclusive, then it is just a matter of eliminating the allergen from your cat's environment, or changing Kitty's food. Your vet will be able to direct you to the best hypo-allergenic food for your cat. Another cause of head congestion in cats is the presence of an infection. The discharge will look very similar to that of a human with a cold. It may start out as a clear fluid, but will become thicker, cloudier and yellowish-green as the infection progresses. Infections can be bacterial, viral or fungal in nature. If the infection is viral, it is most likely a chronic problem and may be feline herpes, rhinotracheitis virus or feline calicivirus. These viruses cannot be cured, but controlled through boosting the immune system. Bacterial and fungal infections can be treated with medication. However, the feline sinus physiology is complicated and filled with nooks and crannies in which pathogens can hide. Cancer of the nasal passages or sinuses is another reason cats become congested. A tumor may start out small, but as it grows, it starts to aggravate and inflame the sinuses, causing congestion. Your vet will have to biopsy the tumor to determine if it is malignant or benign. However, regardless of the results of the biopsy, the mass will almost always have to be surgically removed or your cat will develop chronic runny nose, sneezing and difficulty breathing. Cancer is not always curable simply by removing the mass, but surgery to remove or reduce the mass can significantly improve your cat's quality of life. Polyps are growths occurring just about anywhere in the body. When they grow in your cat's ear, nose or throat, they can cause a whole host of symptoms, including congestion. Depending upon where the polyps are, they can also cause difficulty breathing, eating or hearing. If near the inner ear, they can also cause your cat to lose her balance. Nasal polyps trigger sneezing, which in turn produces massive amounts of mucus. Polyps should be surgically removed or else they will grow and continue to cause breathing problems. Your vet will want to biopsy the polyp tissue to confirm the absence of cancer cells, as it is not always clear from their appearance alone if they are malignant or benign. Are There Cats That Are More Hypoallergenic Than Others? Could a Collapsing Trachea Be Contagious With Other Dogs or Cats? Why Do My Kittens Play in Their Water Bowls? What Do You Give Older Cats for Arthritis? Are Shallots & Garlic Toxic to Cats? What Type of Cats Have Flat Noses?